1,056 PRIZES! 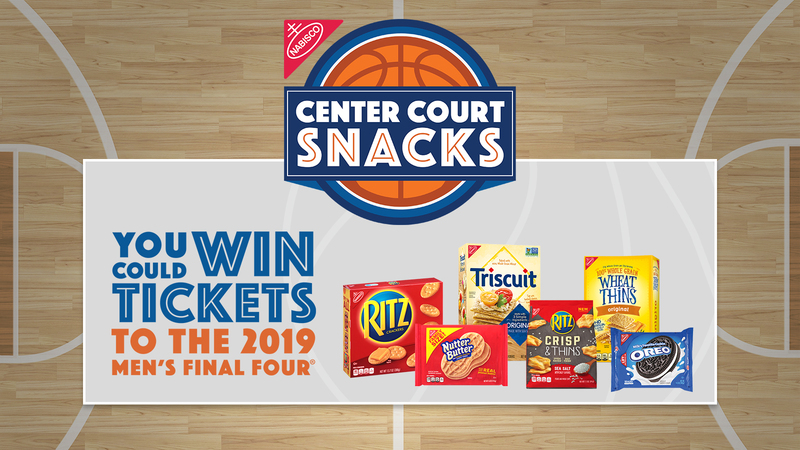 Play the Nabisco Center Court Snacks Instant Win Game today and earn a shot at winning a trip for four to Minneapolis, MN to attend the 2019 NCAA Men’s Final Four and more, PLUS a $25 Gift Card INSTANTLY! Official Rules: open to US, DC, 18 and older. Begins on February 6 and ends on April 3,. Limit up to two Sweepstakes entries (one for Website entry and one entry for Instagram/Twitter, and one Instant Win Game play, per day, per email address/person during the Promotion Period. Plus, bonus referral entries. Limit one sweepstakes prize and one instant win prize per email address/person/household. How to Play: Take a picture of yourself and your game day snack spread including a box/package of Wheat Thins crackers, Ritz crackers, Triscuit crackers, Nutter Butter cookies, or OREO cookies (box/packaging must be included) or picture of yourself with the image provided HERE. Each photograph must be different from any entries previously submitted by you. Photographs that are found to be copies of other Photographs previously entered or to contain content plagiarized from other websites and/or publications will be void and will result in disqualification. Website Sweepstakes and Instant Win Game Entry: Click Here to Enter and follow the links and instructions to complete and submit the registration form, including providing a valid email address. Then, follow the links and instructions to upload your Photograph. You automatically will receive one Sweepstakes entry and advance to the Instant Win Game page and receive one Instant Win Game play. If you receive an Instant Win Game winning message, follow the on-screen instructions to claim your prize. Winners will be chosen at random. Photos will not be judged. Instagram and Twitter Sweepstakes Entry: Post/Tweet your Photograph and include the hashtags #CenterCourtSnacks and #Sweepstakes. Your post/tweet must contain the hashtags #CenterCourtSnacks and #Sweepstakes in order to qualify as an entry. Retweets will not be accepted. Once your Photograph is verified, you will receive one Sweepstakes entry. Photos will not be judged. Five (5) Sweepstakes First Prizes: Nabisco Branded Snack Table Set with Chairs, Assorted Nabisco Product, $200 Gift Card, and $300 in spending cash. ARV: $1,300. Fifty (50) Sweepstakes Second Prizes: Snack Basket with Serving Table, Assorted Nabisco Product, $30 Gift Card. ARV: $200. (1,000) Instant Win Prizes: $25 Gift Card.